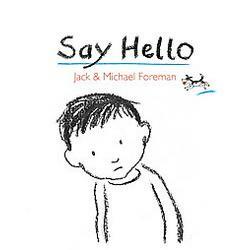 Say Hello is an endearing, spare little book about feeling left out and the importance of including people and making friends. Simple charcoal and pencil drawings on a plain white background tell the story of a lonely dog who makes friends and then passes on the favor to a lonely little boy. I think kids will like this story, and they’ll know what it feels like to be left out of a group and what it feels like to be included. It’s just about being kind to each other and noticing when someone could use a friend. And the end pages are great, filled with the word for “Hello” in lots of different languages. I really liked it, I think preK-2 classes and programs could do a lot with this book.